The story is a light hearted and playful horror twist on how Prince Charming met all of his brides, as well as the tale of Emilia Belles who went from human to zombie after an unfortunate and grave misunderstanding and follows him to find the ingredients for the spell to change her back. Textures to their respective owners! I really like how you did Cinderella with her midnight blue dress, really stunning on her! These character designs are so good, they make me hate my own fairytale characters!!! Is it just me, or is the Sea Witch cute..? Awesome work btw. Yes I think that would be cool! Will you post the Dolla versions of your characters? Awesome designs *w* My favourites are Snow White and Cinderella! They were two of my favorites to work with~ Thank you for the feedback! I love how you use textures! Can you teach me how to overlay textures like that>? If you use a program with layer options, like Paint Tool Sai, Photoshop, Etc, it's very simple. If you want a texture as a background, put it as the very first layer, AKA below all other layers. If you want it as just a mere texture over the picture, then make the texture layer the opposite of what previously said, e.g. putting it above all layers instead of below. So put it above, then make it transparent for how however much you like until you're pleased with it. Unless of course you meant as a separate texture for each character, as shown in this particular picture. If that's what you meant, then, of course, you need a layer program like I said earlier. Get a texture you want to use, place it above the layer you want to. e.g. if you drew a character with a dress, for instance, and you wanted the dress to have the pattern of the texture you are using, then put the texture layer ONLY above the dress layer, it's okay if it's under any other layers. Then use the Wand tool and go to the line-art layer and click anywhere on the background. Now only the background should be selected, then go back to the texture layer above the dress layer, and either erase or clear while on the texture layer still. If done properly, this should make it so the texture only appears on the dress now. Wow these designs are great. I love Queen Morbidia and Repunzel. I love her zombie form more than her human form. I think my favorites are Emilia and Irvine. Because I love zombies and Irvine has a fabulous coat. I can't agree with you more on this one! Thank you for the feedback! I think those two are also my favorites. 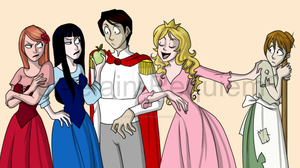 I'm a fan of Wolfie, Briar Rose and Gothel!